The Amazon has seen 3 probable massacres in 12 days — likely a record for the region — as violence has exploded in areas of heavy deforestation where the building of large dams has brought a capital infusion, sent land prices soaring, and invited land speculation by land grabbers, loggers and ranchers. A Brazilian landless movement peasant leader and a leading dam activist are among those killed. 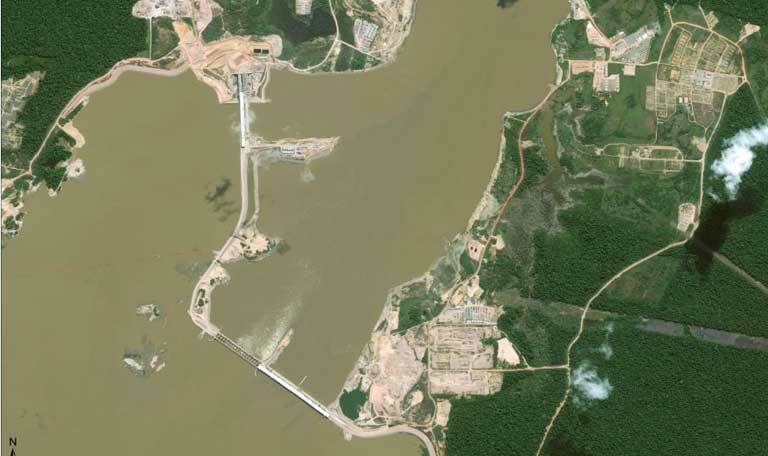 The attacks have been concentrated in areas centered around the Belo Monte mega-dam; in the Madeira basin near the Jirau dam; and near the Tucuruí dam on the Tocantins River in Pará state. Investigations are ongoing, but early reports are that at least 9 people are dead, with some witnesses saying more have been killed, especially rural landless peasant workers. Before becoming president, Jair Bolsonaro expressed strong hostility against the landless peasant movement (Movimento dos Sem Terra, or MST). The Bolsonaro Administration has yet to condemn or comment significantly on the recent wave of killings. As of this article’s publication, the international community has taken little notice of the spike in violence. Violence in the Brazilian countryside is on the rise. In the last two weeks, Amazonia has seen an alarming increase in targeted killings, with three massacres and at least nine deaths. The Catholic Church’s Pastoral Land Commission (CPT) defines a massacre as a killing involving three or more people. The most recent killings took place on 3 April in a landless peasant workers’ camp near the hamlet of Vila de Mocotó in the Altamira municipal district, in southwest Pará state, near the Belo Monte mega-dam. This is not far from Anapu, where Sister Dorothy Stang, an American nun who worked with Amazon landless peasant communities, was murdered in 2005. The squatters were campaigning for the area to be turned into an officially authorized agrarian land reform settlement. According to unconfirmed reports, military police were attempting to evict the settlers at the behest of a man claiming to own the land. The police were reportedly acting without a judicial order. The action ended with one confirmed death, a member of the military police, Valdenilson Rodrigues da Silva. Some witnesses say there were three other victims, all landless workers. These killings occurred just four days after four people are believed to have been killed in Seringal São Domingos, in Ponta do Abunã, a remote area in the Lábrea municipal district near the intersection of the borders of the states of Acre, Amazonas and Rondônia, about 150 kilometres (93 miles) upstream from the Jirau hydroelectric dam. Landless movement squatters, likely traumatized by the violence, remain too afraid to speak openly, but it is believed that many other people remain missing. According to information provided by the Military Police, four hooded and armed men arrived in Seringal São Domingos and told the families living there they must leave their homes. The squatters’ leader, 53-year-old Nemis Machado de Oliveira, was reportedly shot dead. The gunmen then expelled the other squatters by firing shots into the air and burning their homes. Since 2016, about 140 families have been living in Seringal São Domingos, an old rubber plantation, surviving on rubber tapping and subsistence farming. The region has a long history of conflict, involving land grabbers, farmers and loggers. One of the most notorious murders occurred in May 2011 when Adelino Ramos, known as Dinho — a leader of the landless peasant movement (Movimento dos Sem Terra, or MST) — was murdered while selling vegetables he had grown in his settlement, which was officially recognized by INCRA (the federal government’s National Institute of Colonization and Agrarian Reform). Dinho had survived the 1995 Corumbiara massacre, when eight people were killed and hundreds wounded. At the time of his murder, Dinho was active in denouncing illegal loggers along the Acre, Amazonas and Rondônia frontier. These two cases, which may upon investigation turn up a larger number of victims than initially confirmed, both came on the heels of another massacre. 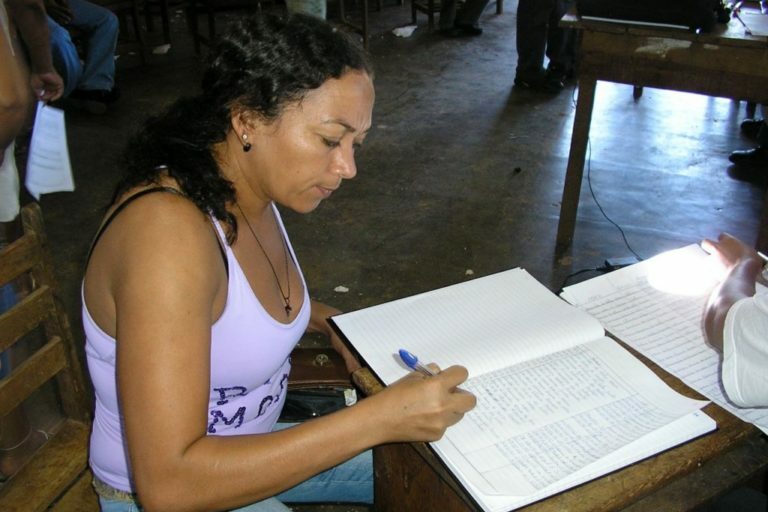 On 22 March, Dilma Ferreira Silva, a socio-environmental activist leader with the Movement of People Affected by Dams (MAB), her husband and a friend, were killed by hooded motorcyclists in the Baião municipal district about 60 kilometers (37 miles) from the Tucuruí dam in Pará state. They were assassinated inside the family home; Dilma had her throat slit after watching her husband and friend killed. Two days later three burnt bodies were found on a cattle ranch just 14 kilometers (9 miles) from the Salvador Allende settlement where Dilma and the other two victims lived. The three new victims were identified as Marlete da Silva Oliveira and Raimundo de Jesus Ferreira, who looked after the ranch, and Venilson da Silva Santos, who worked there as a tractor driver. The man alleged to have organized both sets of killings is Fernando Ferreira Rosa Filho, known as Fernandinho, who has a reputation locally as a dangerous bandit. He is now being investigated by police with respect to all six execution-style killings. The Pastoral Land Commission, which monitors rural violence, considers the two incidents to be part of the same massacre, largely because of the alleged involvement of Fernandinho in both. According to the police, witnesses said that the three ranch employees were considering taking legal action against their employer for not respecting their labor rights. The ranch owner has also been accused of building a clandestine landing strip to facilitate drug trafficking. Local reports suggest that he may have wished to get rid of independently-minded employees. According to the Secretariat of Public Security and Social Defense in Pará state, the crimes are being investigated as an “execution,” but police have not established the motive or found the killers — typical of such attacks in the Amazon. Map showing the location of recent attacks as related to hydroelectric dams, deforested areas and agrarian reform settlements. Map by Mauricio Torres for Mongabay. What do these criminal acts have in common? 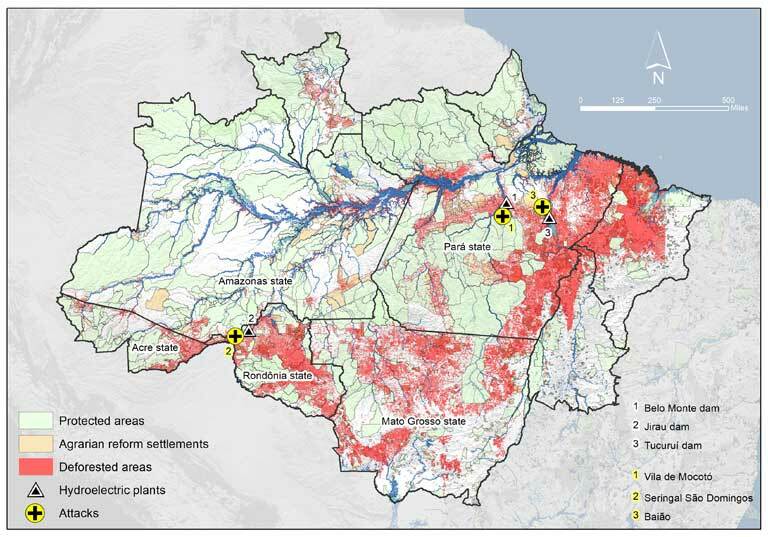 The three attacks on activists involved in social movements or rural workers’ organizations have three characteristics in common: they all occurred in areas within the influence of a large hydroelectric dam; they all happened near or within an agrarian reform settlement; and all are located along one of Amazonia’s primary deforestation fronts (see map 1). Vila de Mocotó, for example, is located just 28 kilometers (17 miles) from the controversial Belo Monte hydroelectric dam. The construction of this dam, the third largest in the world and operational in 2016, led to a massive injection of capital into a rural region that was ill-prepared to receive it. Unsurprisingly, this led to the overheating of the real estate market, sparking a stampede to buy or steal land. Today, land prices are rising even higher in the Xingu basin, as the right-wing Bolsonaro government signals the relaxation of environmental regulations and the fast tracking of large-scale projects, such as the giant proposed gold mine that the Canadian mining company, Belo Sun, wants to open near Belo Monte. As a result, land thieves and illegal loggers are moving rapidly into the nearby Ituna/Itatá indigenous territory. 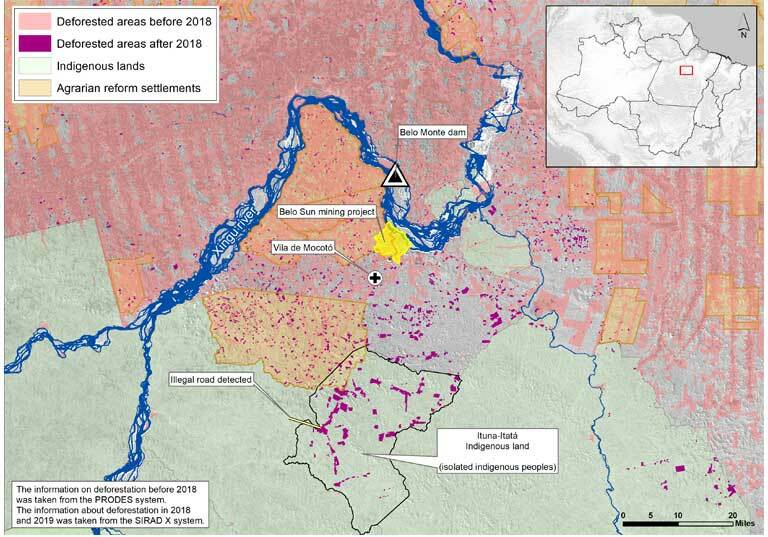 Satellite monitoring and analysis of the territory shows that the number of illegal invasions there has increased enormously since 2017; that’s based on observations by SIRAD-X (Xingu Basin Deforestation Radar System) which uses data provided by the European Space Agency’s Sentinel-1 satellite. In March of this year, SIRAD-X registered the opening of a new illegal road, invading the area from the west (map 2). More deforestation took place in Ituna/Itatá in 2018 than in any other indigenous territory in the Xingu basin. Altogether, 6,785 hectares (16,766 acres) were cleared, a huge increase in illegal cutting. In this single year, almost twice as much forest was felled as the sum total of all deforestation happening there in previous years. The Ituna/Itatá territory is particularly vulnerable because it is not an officially demarcated indigenous territory. Rather, it is an area that has been “interdicted,” where the entry of non-indigenous people has been banned to protect isolated Indians known to be living there. Although anthropologists have gathered convincing evidence of the existence of these indigenous inhabitants, they have not been contacted. As a result, they are clearly unable to organize to drive out intruders, and are entirely dependent on the government for protection. The edict authorizing the “interdiction” must be reissued every three years. However, due to President Bolsonaro’s campaign promise “that not another centimeter of land” will be given to indigenous groups, land thieves apparently became confident that the government would not renew the Ituna/Itatá territory edict, making the 142,000 hectare (548 square mile) area available to them. 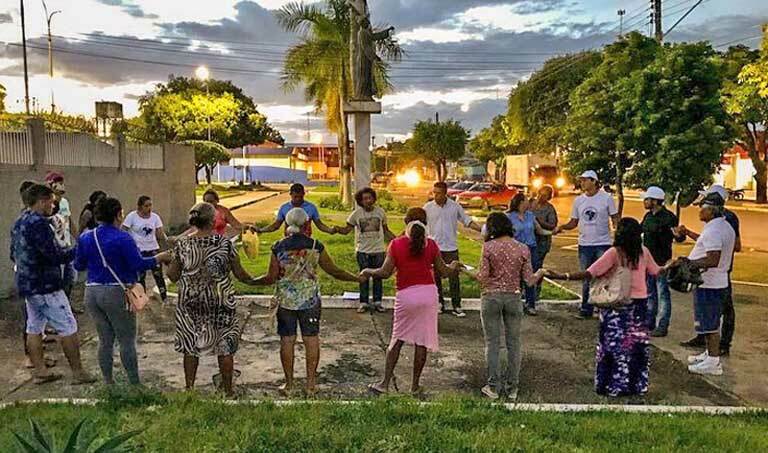 But on 9 January of this year — at the very start of the Bolsonaro Administration— FUNAI, the indigenous agency, unexpectedly renewed the edict for another three years. The land cannot be sold by land thieves while it is still designated as indigenous territory, but even so, deforestation seems likely to continue. The situation is not much different in Ponta do Abunã, located on the Madeira River about 2,000 kilometers (1,240 miles) to the west of Belo Monte on another deforestation front. It is here that Nemis Machado de Oliveira, the leader of the Seringal São Domingos community, was killed. According to a Sustainable Amazonia Plan (Plano Amazônia Sustentável) report, produced by Brazil’s Ministry of the Environment, peasant families in this region are being evicted from their settlements to make way for big cattle ranches. Land seizures gained momentum after 2013 when the controversial Jirau dam became operational. That mega-dam has been heavily criticized by environmentalists and activists for harm done to indigenous communities, terrestrial and aquatic ecosystems. Now a nearly kilometer-long (3,000-foot) bridge is being constructed across the Madeira River at Ponta do Abunã, about 150 kilometers (93 miles) upstream from the Jirau dam. Due to be completed this year, the bridge will extend the BR-364 highway into the state of Acre. Experts fear that the new road will lead to heightened land speculation and possibly to violence. Brazil has multiple plans for a transcontinental railway, with one proposed route slated to cross Acre and Rondônia. The coast-to-coast railroad would allow Brazil to significantly reduce costs of commodity shipments to China, though conservationists fear it would be a death knell for Amazonian forests, indigenous and traditional ways of life. 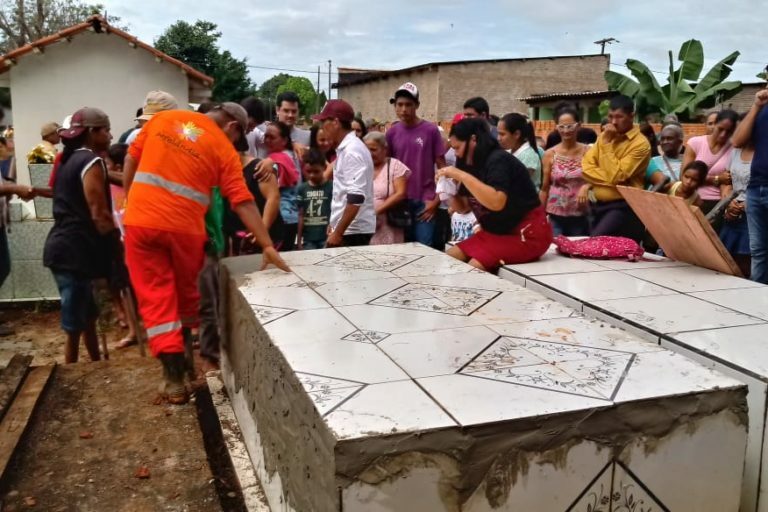 The other massacre – the killing of Dilma Ferreira Silva and two others – in the municipal district of Baião lies within the area of influence of the Tucuruí dam, a project initiated by the military government and completed in 1984. Inhabitants affected by the dam are still fighting 35 years later for compensation, and the region, suffering from heavy deforestation, regularly sees a high level of violence. If the deaths of at least six peasants in the two most recent attacks are confirmed, Brazil will have achieved an historic record — three massacres in less than two weeks. In response to the increased rural violence, the Pastoral Land Commission (CPT) has launched a new website: Massacres in the Countryside. That page will be updated with newly confirmed reports of massacres — a killing involving three or more people. Between 1985 and 2017, CPT recorded 45 massacres in which 214 people in nine states were killed. Pará state saw the largest number of massacres over this period — 26 in all, in which 125 people were killed, over half of the victims in all of the massacres. 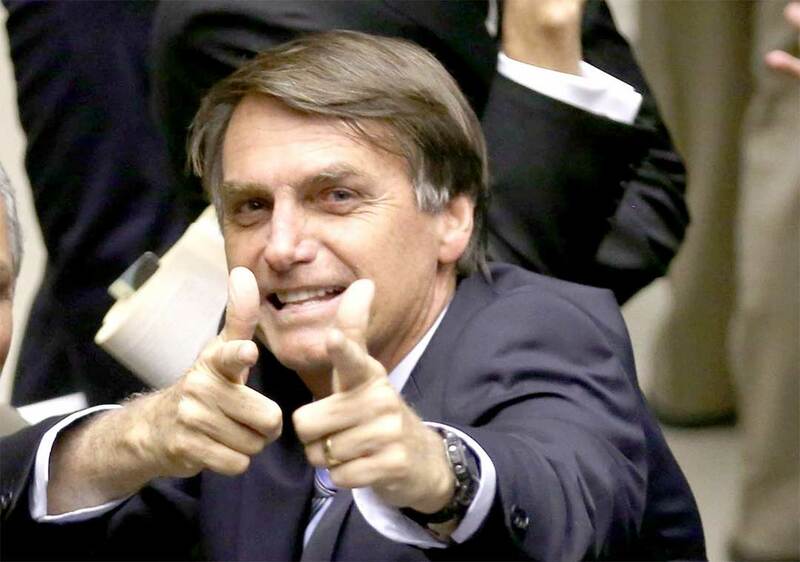 Jair Bolsonaro pretending to shoot a gun, a gesture suggestive of violence that the former Army captain often uses in his speeches and television appearances. Image by Carlos Eugênio. The federal government has so far not condemned the rise in violence that has occurred since Jair Bolsonaro came to power in January. On taking office, President Bolsonaro moved INCRA, which used to be attached to the Presidency, to the Agriculture Ministry, which some analysts say is a conflict of interest. INCRA is now headed by a military officer, General Jesus Corrêa. He said after his appointment that his aim was to remove “bad yolks without breaking the eggs.” Social movements interpreted this to be an expression of his determination to root out landless movement activists from the settlements. 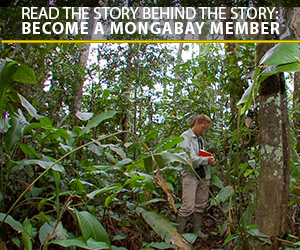 At the time this story went to press, the Ministry of Justice had not responded to Mongabay’s request for comment.